Their new in-store tech, powered by Microsoft’s Azure cloud, is being symbolically piloted in two locations in Ohio and Washington (near Kroger and Microsoft’s respective headquarters) and includes EDGE shelving, a virtual store manager, and, the companies hope, a viable alternative to Amazon’s forthcoming GO concept and its web services (AWS). Like a much overdue load of groceries sitting on the counter, there’s a lot to unpack here so, roll up your sleeves, it’s time to put in some grocery industry market research to understand how this platform will help build out Kroger’s omnichannel aspirations, help Microsoft build up its Azure cloud and redefine itself in a new digital era, and allow both companies (and others) to ride the digital tide without Amazonian tributaries. While the piloted innovations are promising, they are nowhere near the cashierless experience Amazon promises with its Go brand, which is reported to have 3,000 locations in development. But they are noticeably ahead of Kroger’s other 2,800 stores as well as any other legacy grocer in the market place. The centerpiece of the partnership is their EDGE (Enhanced Display for Grocery Environment) shelving system, which uses digital displays instead of paper tags to indicate prices, promotions, nutritional facts, and personalized info. That personalized info bit is important—if customers opt in through Kroger’s existing loyalty/rewards program, they can see their personal dietary needs (gluten free, lactose intolerant, paleo) addressed within these displays. These displays can also be used to help customers find items on their list—personalized icons will appear to direct customers to items they seek—and the same technology can be used by in-store employees fulfilling online orders. Obviously, this will make in-store and omnichannel shopping more seamless, a clear priority in a changing grocery landscape. 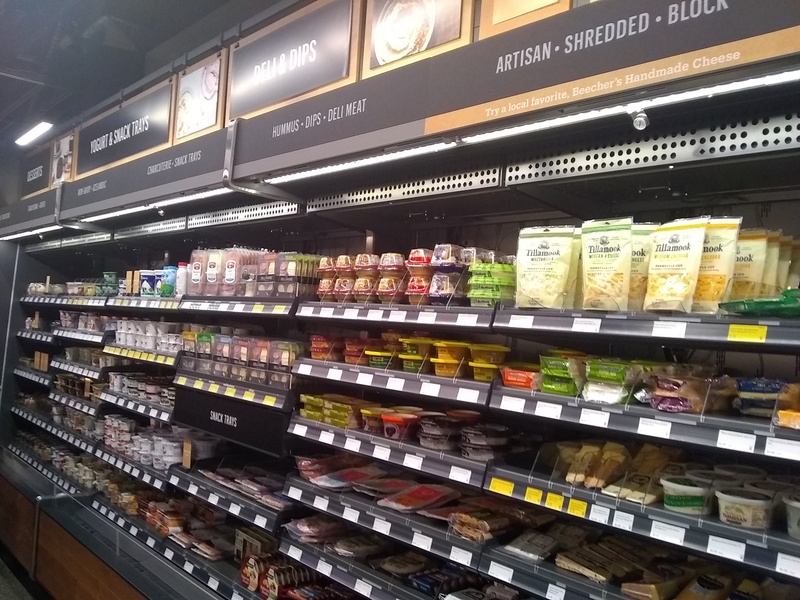 The tech is being presented as a differentiator in terms of customer experience, but EDGE shelving may prove more exciting for CPG companies occupying shelf space because this is the next step in in-store marketing. Indeed, according to Bloomberg, Microsoft cloud-based AI will be able to guess customer’s age and gender (and, let’s be honest: though they aren’t talking about it, probably race too). With this information, the technology will offer CPG brands the opportunity to target EDGE shelve advertisements to specific consumer demographics, hopefully increasing in-store sales while also providing Kroger an additional revenue stream. 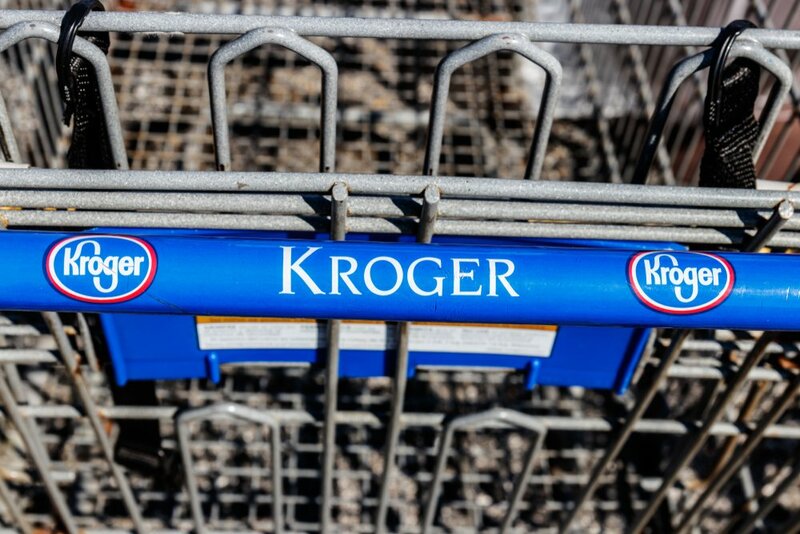 The technology will also help Kroger augment its already consumer profiling technology, which can help their own sales as well as be sold to manufactures. Because, as we will see, while this tech is being presented as a customer-facing differentiator, it is just as much about finding alternative revenue streams as the already saturated grocery market yields less and less opportunity for growth. Also on offer, an in-development product called Virtual Store Manager. This is a cloud-based AI that alerts actual managers of situations that are tough to monitor, such as fridge temps, shopping cart supplies, and out-of-stocks. Like the EDGE technology, this is as much for Kroger as it is for sale. Yet this is not solely (or even predominately) about updating and optimizing the in-store experience with some newfangled technology. No, of course it will not do to have Amazon constantly stealing headlines declaring their stores the Avant Gard beacon of grocery’s future—as the nation’s number one grocery store, Kroger cannot play second fiddle. But their aims and eyes are much bigger than that. Ultimately, Kroger and Microsoft hope this partnership will launch a Retail-as-a-Service platform that other retailers, equally uninterested in lining Bezos’s AWS pockets, will adopt. By adopting Kroger and Microsoft’ Virtual Store Manager, places like Macy’s, Walmart, and Ahold can still outsource their massive digital workloads without jumping into the Amazon. With aspirations of reaching $400 million in operation profit by 2020, Kroger knows it needs alternate profit streams. That’s because their actual core grocery business is not expected to grow too very much in the coming years. Obviously, This is big news for Microsoft as well. Like Kroger (and everybody else in the game), the aging software pioneer is looking for new revenue streams and this includes growing Azure, its cloud storage system, and the artificial intelligence functions that can be layered into it, Azure AI. And, also like Kroger and other retailers, Microsoft has an Amazon problem. Already lagging behind AWS as well as Alexa (does anybody use Cortana?) Microsoft would love to find a way to bolster its own products while also horning in on Amazon’s early-established marketspace. Walmart formed its own Microsoft partnership last summer and Microsoft seems content to establish itself as the tech alternative to Amazon, particularly for companies who count Amazon products among their direct competitors. For Microsoft CEO Satya Nadella, "Our partnership brings together Kroger's world-class expertise in the grocery industry with the power of Azure and Azure AI. Together, we will redefine the shopping experience for millions of customers at both Kroger and other retailers around the world, setting a new standard for innovation in the industry." 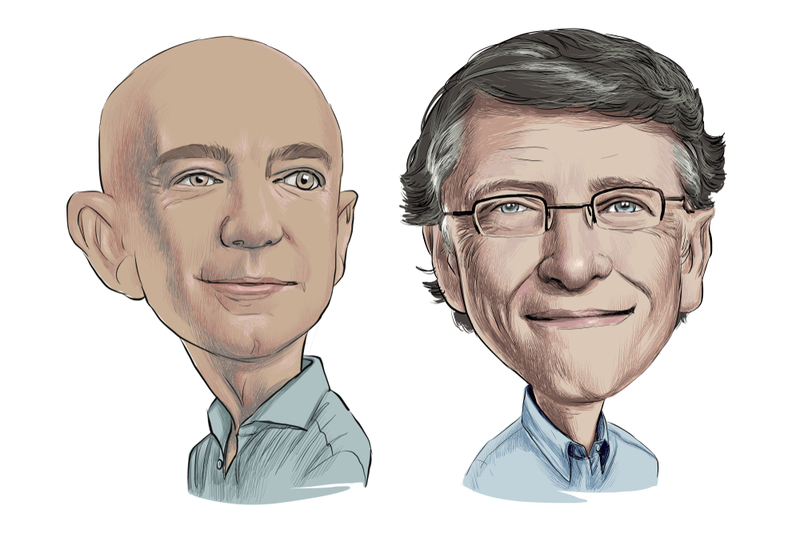 That new standard, they hope, is measured against, and ultimately rivals, Amazon’s. Sounds like everybody is ganging up on Amazon, but let’s not shed any tears on their behalf. Because, for Amazon, the math and formula for future growth is somewhat simple; for brick-and-mortar grocers it’s simply terrifying. First, consider that Amazon already owns ½ of online retail in the United States. Second, online grocery sales are predicted to capture 20% of total grocery retail by 2025, reaching $100 billion. Third, Amazon is on the cutting edge of omnichannel development, in retail writ large and increasingly in grocery specifically. So, for them, it’s full steam ahead and the future can’t come fast enough. Legacy grocers like Kroger however, would like to disrupt the disruptor’s march to digital dominance. At least in grocery, that is. Because other battles for dominance are likely already lost. Keep in mind that Amazon is roughly 60 times bigger than the amount it paid for the Whole Foods acquisition. They already pull in $29 billion in online sales and $4.25 billion in physical store sales. Oh, and AWS brought in $6.68 billion last quarter. And in one of those instances that people confuse for ironic (what hath Alanis Morrissette wrought?!) but is actually just unfortunately appropriate, Amazon is now looking into acquiring former Sears locations as they expand their Whole Foods footprint. So, in the race to omnichannel, there may be some new relay partners but Amazon is still out in front. In a joint press conference with MS CEO Satya Nadella, Kroger CEO Rodney McMullen said, “Together we can create something that, separately, we could not.” Though the quote refers to the RaaS in-store platform, he could well be speaking about an Amazon buster. Just like a shared Amazon problem got Google and Walmart together, so too has it bound Cincinnati to Redmond.